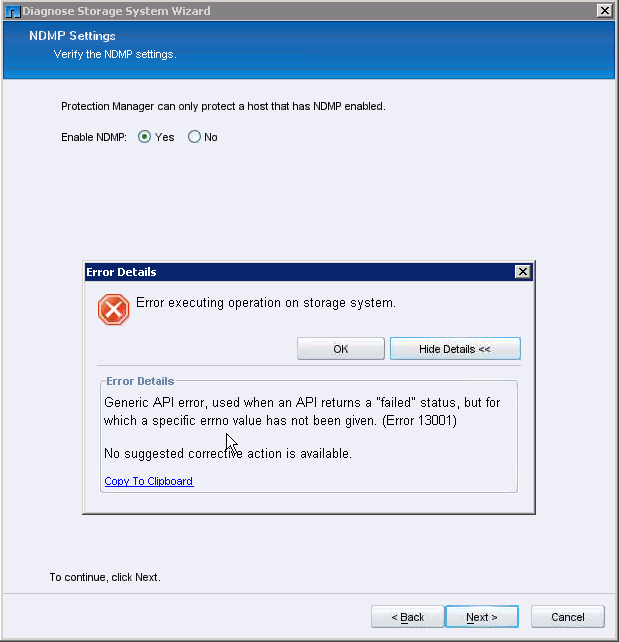 I am helping demo protection manager and am hitting an error on enabling NDMP on the NMC using protection manager 3.8.1 ( NMC also downloaded frm 3.8.1 ) on W2K8, 64 bit, 16 GB ram. We have a test cluster running 7.2.2 and a destination filer at 7.3.1.1P7; we created a user using USERADMIN USER ADD opsmgr -g "Backup Operators" and then used NDMP PASSWORD opsmgr to create the TEXT password. But when we enable NDMP on the GUI below, we crash out. The filer credentials are fine. can you try using cli and get the error if any. then do a dfm host diag <hostname-or-id> to see what is the ndmp status. Another approach is to let the host diag wizard create the user for you. Don't create it from the ONTAP CLI first. A final thought is that this is more to do with the login credentials, not the NDMP user. If rsh/ssh is not working, we may be having troubles. You have my interest here ... "host diag wizard" ... is this the "diagnose" right click option on the controller? I will run with Adai's suggestions first and take yours for the rsh/ssh, to make sure rsh/ssh is working correctly ( rsh/ssh filer version - should be sufficent to test remote protocols ).